MURCIA, Spain (AP) — Watching from a distance as police surrounded a group of protesters yelling “Fascists go home!” Encarna Sanchez hesitated over whether to join a political rally held by Spain’s far-right Vox party. Neglected, working-class suburbs and rural areas with high unemployment are where the Euroskeptic, anti-feminist and staunchly patriotic party is trying to enlist support that could lift it out of the shadows in a country that has been slow to embrace the extreme right. The last far-right Spanish lawmaker lost his seat in parliament in 1982. Academics have attributed their absence since then to painful memories of the country’s long right-wing dictatorship and the prominence of the conservative Popular Party across all the political space from center to right. Only more recently has the PP ceded ground to the Citizens party, a new center-right group that surged in popularity as an opposition to regionalist parties in Catalonia and other areas. But some saw that barrier falling when Vox garnered a 1.4-percent share of votes in official polls last month, setting the four-year-old party on track to enter the lower house of parliament in general elections due before 2020. “Even one seat would be enough to use it as a platform for our message to reach all Spaniards,” Vox President Santiago Abascal told The Associated Press, outlining a plan to use a regional Andalusian election in 10 days’ time and the European Parliament ballot in May next year as stepping stones. The scion of a family targeted by the separatist militant group ETA in his native Basque region, Abascal refuses to waste time fending off criticism that he is a fascist, racist, fear-monger or far-right populist, all of which he dismisses as attempts to stigmatize his movement. Vox politicians are frequently ridiculed by mainstream media for their defense of everything Spanish, from bullfighting to the monarchy, and nostalgia for historical events — such as the 15th-century ousting of Muslims from the Kingdom of Castile and the colonization of the American continent. “We will stand against them coming here to tell us that in our schools we can’t eat ham,” Abascal said, eliciting wide applause from the audience. Outside, police dispersed protesters waving rainbow flags and signs supporting gender equality. Spain’s foreign population, which started growing at the turn of the century, now makes up 10 percent of the 46.7 million residents, with Moroccan, Romanian and British nationals topping the list. A 100-issue party manifesto begins by stating that the northeastern Catalonia region should lose its self-government after last year’s attempt to split from Spain and that separatist parties should be outlawed. Vox also advocates changing laws on domestic violence and restricting abortion. But their two flagship issues, a stronger hand on migration and the defense of Spain’s unity, could also be Vox’s main obstacle as it tries to grab a foothold, said Carmen Gonzalez, a researcher with the Elcano Royal Institute, an official think tank. Reporting about Vox has picked up in the media, however, and the party’s propagandists have been skilled enough to magnify that attention using social media and messaging apps to stir debate and reach new constituents. In a widely shared video last week, Abascal and a well-known bullfighter rode horses, accompanied an epic soundtrack. Some party leaders also earned fame two years ago by swimming back to Spain to escape arrest in the disputed British overseas territory of Gibraltar after raising a Spanish flag. One of those, Vox’s secretary general Javier Ortega, acted as a prosecuting lawyer in the judicial probe against the Catalans who organized an illegal independence referendum in October 2017. That presence in the public sphere has helped earn Vox more than 16,000 paying members. Last week’s rally sold out in Murcia, where Abascal’s previous visit drew only enough people to fill the outdoor space of a coffee house. The party says it has received separate invitations from the Europe of Nations and Freedom, the smallest group in the European Parliament, and the Alliance of Conservatives and Reformists in Europe, linked to the Republican Party in the United States. But the party is finding it difficult to connect with other European peers because some of them have expressed sympathy for Catalan separatists, a no-go zone for Vox. Notes have been compared with Steve Bannon, but Abascal also doesn’t plan for now to join the wide coalition of Euroskeptic movements led by the former White House adviser — even though U.S. President Donald J. Trump inspired the “Make Spain great again” slogan used by Vox in early campaigning. 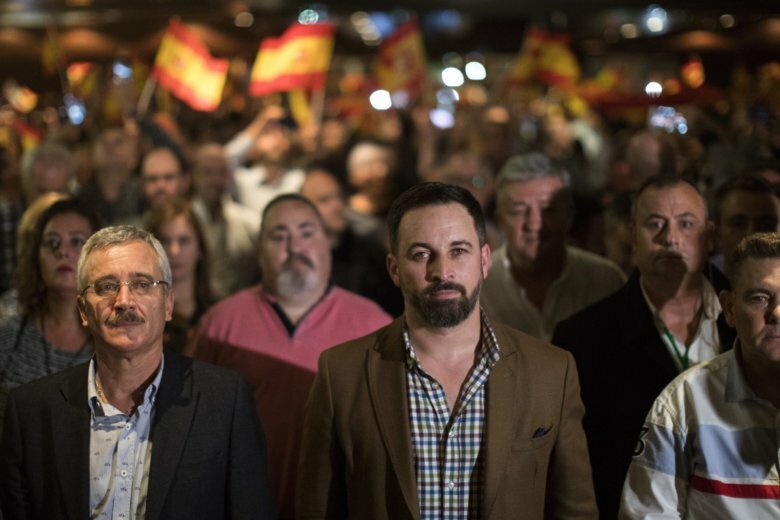 “Our references are not international, because the issues that we fight for are national,” said Abascal, who also is not concerned about voter mood changes over parties like his.